To support a framework for providing networking products in the UNIX® system, an effort is underway to define service interfaces that map to strategic levels of the Open Systems Interconnection (OSI) Reference Model . These service interfaces hide implementation details of a particular service from the consumer of the service. This enables system programmers to develop software independent of the particular protocol that provides a specific service. The interfaces being specified for UNIX® System V are defined within the STREAMS environment. This document specifies a kernel-level interface that supports the services of the Transport Layer for connection-mode and connectionless mode services. This specification applies to System V Release 4.2 ES/MP . This version of the transport provider interface supports the XPG4 version of the X/Open Transport Interface (XTI) . 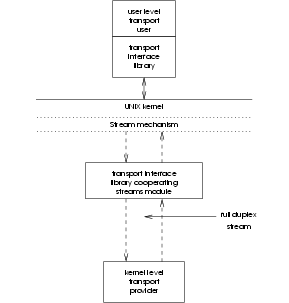 A user communicates to a transport provider via a full duplex path known as a stream (see Figure 1). This stream provides a mechanism in which messages may be passed to the transport provider from the transport user and vice versa. A M_PROTO message block followed by zero or more M_DATA message blocks. The M_PROTO message block contains the type of transport service primitive and all the relevant arguments associated with the primitive. The M_DATA blocks contain transport user data associated with the transport service primitive. One M_PCPROTO message block containing the type of transport service primitive and all the relevant arguments associated with the primitive. One or more M_DATA message blocks containing transport user data. The following sections describe the transport primitives which define both a connection-mode and connectionless-mode transport service. For both types of transport service, two types of primitives exist: primitives which originate from the transport user and primitives which originate from the transport provider. The primitives which originate from the transport user make requests to the transport provider or respond to an event of the transport provider. The primitives which originate from the transport provider are either confirmations of a request or are indications to the transport user that an event has occurred. Section 2 lists the primitive types along with the mapping of those primitives to the STREAMS message types and the transport primitives of the ISO IS 8072 and IS 8072/DAD transport service definitions. The format of these primitives and the rules governing the use of them are described in sections 2.1, 2.2, and 2.3. The following transport primitives are common to both the connection-mode and connectionless-mode transport services. The following describes the format of the transport primitives which are generated by the transport user. 2.1.1.1 T_INFO_REQ - get transport protocol parameter sizes. Where PRIM_type indicates the primitive type. Acknowledgement of the primitive via the T_INFO_ACK described in T_INFO_ACK. There are no errors associated with the issuance of this primitive. 2.1.1.2 T_BIND_REQ - bind protocol address request. Where PRIM_type indicates the primitive type. ADDR_length is the length4 of the protocol address to be bound to the stream and ADDR_offset is the offset from the beginning of the M_PROTO block where the protocol address begins. CONIND_number5 is the requested number of connect indications6 allowed to be outstanding by the transport provider for the specified protocol address. The proper alignment of the address in the M_PROTO message block is not guaranteed. The address in the M_PROTO message block is however, aligned the same as it was received from the transport user. For rules governing the requests made by this primitive, see T_BIND_ACK. Correct acknowledgement of the primitive is indicated via the T_BIND_ACK primitive. This indicates that the protocol address was in an incorrect format or the address contained illegal information. It is not intended to indicate protocol errors. This indicates that the transport provider could not allocate an address. This indicates that the user did not have proper permissions for the use of the requested address. The primitive would place the transport interface out of state. This indicates that the requested address is already in use. 2.1.1.3 T_UNBIND_REQ - unbind protocol address request. Correct acknowledgement of the primitive is indicated via the T_OK_ACK primitive described in T_OK_ACK. 2.1.1.4 T_OPTMGMT_REQ - options management. Negotiate and set the options with the transport provider. Check the validity of the specified options. Return the options currently in effect. For the rules governing the requests made by this primitive see the T_OPTMGMT_ACK primitive in T_OPTMGMT_ACK. Acknowledgement of the primitive via the T_OPTMGMT_ACK. This indicates that the user did not have proper permissions for the use of the requested options. This indicates that the options as specified were in an incorrect format, or they contained illegal information. This indicates that the flags as specified were incorrect or illegal. This transport provider does not support the requested flag (T_CHECK or T_CURRENT). 2.1.1.5 T_ADDR_REQ - get protocol addresses request. This primitive requests that the transport provider return the local protocol address that is bound to the stream and the address of the remote transport entity if a connection has been established. Correct acknowledgement of the primitive is indicated via the T_ADDR_ACK primitive. The following describes the format of the transport primitives which are generated by the transport provider. 2.1.2.1 T_INFO_ACK - protocol information acknowledgement. This indicates the primitive type. A value greater than zero specifies the maximum size of a transport service data unit (TSDU); a value of zero specifies that the transport provider does not support the concept of TSDU, although it does support the sending of a data stream with no logical boundaries preserved across a connection; a value of ‘-1’ specifies that there is nolimit on the size of a TSDU; and a value of ‘-2’ specifies that the transfer of normal data is not supported by the transport provider. A value greater than zero specifies the maximum size of an expeditedtransport service data unit (ETSDU); a value of zero specifies that the transport provider does not support the concept of ETSDU, although it does support the sending of an expedited data stream with no logical boundaries preserved across a connection; a value of ‘-1’ specifies thatthere is no limit on the size of an ETSDU; and a value of ‘-2’ specifies that the transfer of expedited data is not supported by the transport provider. A value greater than or equal to zero specifies the maximum amount of data that may be associated with connection establishment primitives; and a value of ‘-2’ specifies that the transport provider does not allow data to be sent with connection establishment primitives. A value greater than or equal to zero specifies the maximum amount of data that may be associated with the disconnect primitives; and a value of ‘-2’ specifies that the transport provider does not allow data to be sent with the disconnect primitives. A value greater than or equal to zero indicates the maximum size of a transport protocol address; and a value of ‘-2’ specifies that the transport provider does not provide user access to transport protocol addresses. A value greater than or equal to zero indicates the maximum number of bytes of protocol-specific options supported by the provider; a value of ‘-2’ specifies that the transport provider does not support user-settable options although they're read-only; and a value of -3 specifies that the transport provider does not support any options. 7 This is the size of the transport protocol interface data unit, and should not exceed the tunable system limit, if non-zero, for the size of a STREAMS message. The provider service is connection oriented with no orderly release support. The provider service is connection oriented with orderly release support. The provider service is a connectionless transport service. This is the current state of the transport provider. This flag indicates that the transport provider supports the sending of zero-length TSDUs. This indicates that the transport provider conforms to XTI in XPG4 and supports the new primitives T_ADDR_REQ and T_ADDR_ACK. The ETSDU_size, CDATA_size and DDATA_size fields should be ‘-2’. The TSDU_size should equal the TIDU_size. 2.1.2.2 T_BIND_ACK - bind protocol address acknowledgement. long ADDR_length;   /* length of address - see note in sec. Where PRIM_type indicates the primitive type. ADDR_length is the length of the protocol address that was bound to the stream and ADDR_offset is the offset from the beginning of the M_PCPROTO block where the protocol address begins. CONIND_number8 is the accepted number of connect indications allowed to be outstanding by the transport provider for the specified protocol address. The proper alignment of the address in the M_PCPROTO message block is not guaranteed. If the ADDR_length field in the T_BIND_REQ primitive is ‘0’, then the transport provider must assign a transport protocol address to the user. The transport provider is to bind the transport protocol address as specified in the T_BIND_REQ primitive. If the requested transport protocol address is in use or if the transport provider cannot bind the specified address, it must return an error. The returned value must be less than or equal to the corresponding requested number as indicated in the T_BIND_REQ primitive. If the requested value is greater than zero, the returned value must also be greater than zero. Only one stream that is bound to the indicated protocol address may have a negotiated accepted number of maximum connect requests greater than zero. If a T_BIND_REQ primitive specifies a value greater than zero, but another stream has already bound itself to the given protocol address with a value greater than zero, the transport provider must return an error. If a stream with CONIND_number greater than zero is used to accept a connection, the stream will be found busy during the duration of that connection and no other streams may be bound to that protocol address with a CONIND_number greater than zero. This will prevent more than one stream bound to the identical protocol address from accepting connect indications. A stream requesting a CONIND_number of zero should always be legal. This indicates to the transport provider that the stream is to be used to request connections only. If the above rules result in an error condition, then the transport provider must issue an T_ERROR_ACK primitive to the transport user specifying the error as defined in the description of the T_BIND_REQ primitive. 2.1.2.3 T_OPTMGMT_ACK - option management acknowledgement. Where PRIM_type indicates the primitive type. OPT_length is the length of the protocol options associated with the primitive and OPT_offset is the offset from the beginning of the M_PCPROTO block where the options begin. The proper alignment of the options is not guaranteed. MGMT_flags should be the same as those specified in the T_OPTMGMT_REQ primitive with any additional flags as specified below. The following rules apply to the T_OPTMGMT_ACK primitive. If the value of MGMT_flags in the T_OPTMGMT_REQ primitive is T_DEFAULT, the provider should return the default provider options without changing the existing options associated with the stream. If the value of MGMT_flags in the T_OPTMGMT_REQ primitive is T_CHECK, the provider should return the options as specified in the T_OPTMGMT_REQ primitive along with the additional flags T_SUCCESS or T_FAILURE which indicate to the user whether the specified options are supportable by the provider. The provider should not change any existing options associated with the stream. If the OPT_length field of the T_OPTMGMT_REQ primitive is ‘0’, then the transport provider is to set and return the default options associated with the stream in the T_OPTMGMT_ACK primitive. If options are specified in the T_OPTMGMT_REQ primitive, then the transport provider should negotiate those options, set the negotiated options and return the negotiated options in the T_OPTMGMT_ACK primitive. It is the user's responsibility to check the negotiated options returned in the T_OPTMGMT_ACK primitive and take appropriate action. If the value of MGMT_flags in the T_OPTMGMT_REQ primitive is T_CURRENT, the provider should return the current options that are currently associated with the stream. If the value of MGMT_flags in the T_OPTMGMT_REQ primitive is either T_NEGOTIATE or T_CHECK and the transport provider cannot support the requested flag, an error is to be returned. If the above rules result in an error condition, the transport provider must issue a T_ERROR_ACK primitive to the transport user specifying the error as defined in the description of the T_OPTMGMT_REQ primitive. 2.1.2.4 T_ERROR_ACK - error acknowledgement. This indicates that the protocol address as specified in the primitive was in an incorrect format or the address contained illegal information. This indicates that the options as specified in the primitive were in an incorrect format, or they contained illegal information. This indicates that the stream queue pointer as specified in the primitive was illegal. This indicates that the user did not have proper permissions. The primitive would place the interface out of state. The amount of user data specified was illegal. The transport provider requires that the responding stream is bound to the same address as the stream on which the connection indication was received. The transport provider does not support the requested capability. 2.1.2.5 T_OK_ACK - success acknowledgement. Where PRIM_type identifies the primitive. CORRECT_prim contains the successfully received primitive type. 2.1.2.6 T_ADDR_ACK - get protocol addresses acknowledgement. Where PRIM_type indicates the primitive type. LOCADDR_length is the length of the protocol address that was bound to the stream and LOCADDR_offset is the offset from the beginning of the M_PCPROTO block where the protocol address begins. If the stream is in the data transfer state, REMADDR_length is the length of the protocol address of the remote transport entity and REMADDR_offset is the offset from the beginning of the M_PCPROTO block where the protocol address begins. If the interface is in any state but T_DATA_XFER, the values returned for REMADDR_length and REMADDR_offset must be ‘0’. If the interface is in the T_UNINIT or T_UNBND state, the values returned for LOCADDR_length and LOCADDR_offset must be ‘0’. The following transport primitives pertain only to the connection-mode transport service. 2.2.1.1 T_CONN_REQ - connect request. Where PRIM_type identifies the primitive type. DEST_length is the length of the destination address and DEST_offset is the offset from the beginning of the M_PROTO message block where the destination address begins. Similarly, OPT_length and OPT_offset describe the location of the requested options associated with the primitive. The proper alignment of the destination address and options in the M_PROTO message block is not guaranteed.10 The destination address and options in the M_PROTO message block are however, aligned the same as they were received from the transport user. This indicates that the user did not have proper permissions for the use of the requested address or options. This indicates that the protocol address was in an incorrect format or the address contained illegal information. It is not intended to indicate protocol connection errors, such as an unreachable destination. 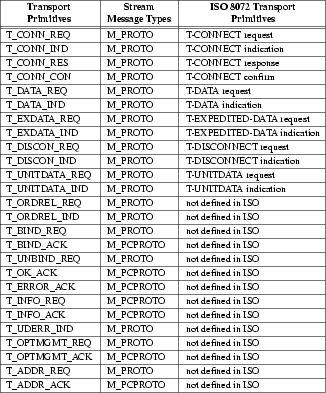 Those error types are indicated via the T_DISCON_IND primitive. This indicates that the options were in an incorrect format, or they contained illegal information. This transport provider does not support multiple connections with the same local and remote addresses. 2.2.1.2 T_CONN_RES - connection response. Where PRIM_type identifies the primitive type. QUEUE_ptr identifies the transport provider queue pair (i.e. read queue pointer) which should be used to accept the connect request. This queue pointer should map onto a stream which is already bound to a protocol address but if the stream is not bound, the transport provider must bind it to the same protocol address that was bound to the stream on which the connection indication arrived. OPT_length is the length of the responding options and OPT_offset is the offset from the beginning of the M_PROTO message block where the responding options begin. SEQ_number is the sequence number which identifies the connection to be responded to. The proper alignment of the options in the M_PROTO message block is not guaranteed. The options in the M_PROTO message block are, however, aligned the same as they were received from the transport user. This indicates that the response queue pointer was illegal. This indicates that the user did not have proper permissions for the use of the options or response id. This indicates that the protocol address was in an incorrect format or the address contained illegal information. 2.2.1.3 T_DISCON_REQ - disconnect request. Where PRIM_type identifies the primitive type. SEQ_number identifies the outstanding connect indication that is to by denied. If the disconnect request is disconnecting an already existing connection, then the value of SEQ_number will be ignored. 2.2.1.4 T_DATA_REQ - data request. Where PRIM_type identifies the primitive type. MORE_flag when greater than zero, indicates that the next T_DATA_REQ primitive is also part of this transport service data unit. The transport provider must also recognize a message of one or more M_DATA message blocks without the leading M_PROTO message block as a T_DATA_REQ primitive. This message type will be initiated from the WRITE(BA_OS) operating system service routine. In this case there are no implied transport service data unit boundaries, and the transport provider may view this message type as a self contained transport service data unit. If these two types of messages are intermixed, then transport service data boundaries may be lost. The transport service interface was found to be in an incorrect state. If the interface is in the T_IDLE state when the provider receives the T_DATA_REQ primitive, then the transport provider should just drop the message without generating a fatal error. The amount of transport user data associated with the primitive defines a transport service data unit larger than that allowed by the transport provider. 2.2.1.5 T_EXDATA_REQ - expedited data request. Where PRIM_type identifies the primitive type. MORE_flag when greater than zero indicates that the next T_EXDATA_REQ primitive is also part of this expedited transport service data unit. The transport service interface was found to be in an incorrect state. If the interface is in the T_IDLE state when the provider receives the T_EXDATA_REQ primitive, then the transport provider should just drop the message without generating a fatal error. The amount of transport user data associated with the primitive defines an expedited transport service data unit larger than that allowed by the transport provider. 2.2.1.6 T_ORDREL_REQ - orderly release request. Where PRIM_type identifies the primitive type. The primitive would place the interface in an incorrect state. 2.2.2.1 T_CONN_IND - connect indication. long SRC_length;    /* source addr length - see note in sec. Where PRIM_type identifies the primitive type. SRC_length is the length of the source address and SRC_offset is the offset from the beginning of the M_PROTO message block where the source address begins. Similarly, OPT_length and OPT_offset describe the location of the requested options associated with the primitive. SEQ_number should bean unique number other than ‘-1’ to identify the connect indication. The proper alignment of the source address and options in the M_PROTO message block is not guaranteed. 2.2.2.2 T_CONN_CON - connection confirm. Where PRIM_type identifies the primitive type. RES_length is the length of the responding address that the connection was accepted on and RES_offset is the offset from the beginning of the M_PROTO message block where the responding address begins. Similarly, OPT_length and OPT_offset describe the size and location of the confirmed options associated with the primitive. The proper alignment of the responding address and options in the M_PROTO message block is not guaranteed. 2.2.2.3 T_DISCON_IND - disconnect indication. long DISCON_reason; /* disconnect reason - see note in sec. Where PRIM_type identifies the primitive type and DISCON_reason is the reason for disconnect. The reason codes are protocol specific. SEQ_number is the sequence number which identifies which connect indication was denied, or it is ‘-1’ if the provider is disconnecting an existing connection. The SEQ_number is only meaningful when this primitive is sent to a passive user who has the corresponding connect indication outstanding. It allows the transport user to identify which of its outstanding connect indications is associated with the disconnect. 2.2.2.4 T_DATA_IND - data indication. Where PRIM_type identifies the primitive type. MORE_flag, when greater than zero, indicates that the next T_DATA_IND primitive is also part of this transport service data unit. If a TSDU spans multiple T_DATA_IND message blocks, then an ETSDU may be placed in between two T_DATA_IND message blocks. Once an ESTDU is started, then the ETSDU must be completed before any T_DATA_IND message blocks defining a TSDU is resumed. 2.2.2.5 T_EXDATA_IND - expedited data indication. Where PRIM_type identifies the primitive type. MORE_flag, when greater than zero, indicates that the next T_EXDATA_IND primitive is also part of this expedited transport service data unit. 2.2.2.6 T_ORDREL_IND - orderly release indication. The following transport primitives pertain only to the connectionless-mode transport service. 2.3.1.1 T_UNITDATA_REQ - unitdata request. Where PRIM_type identifies the primitive type. DEST_length is the length of the destination address and DEST_offset is the offset from the beginning of the M_PROTO message block where the destination address begins. Similarly, OPT_length and OPT_offset describe the location of the requested options associated with the primitive. The proper alignment of the destination address and options in the M_PROTO message block is not guaranteed. The destination address and options in the M_PROTO message block are, however, aligned the same as they were received from the transport user. The transport service interface was found to be in an incorrect state. The amount of transport user data associated with the primitive defines an transport service data unit larger than that allowed by the transport provider. 2.3.2.1 T_UNITDATA_IND - unitdata indication. Where PRIM_type identifies the primitive type. SRC_length is the length of the source address and SRC_offset is the offset from the beginning of the M_PROTO message block where the source address begins. 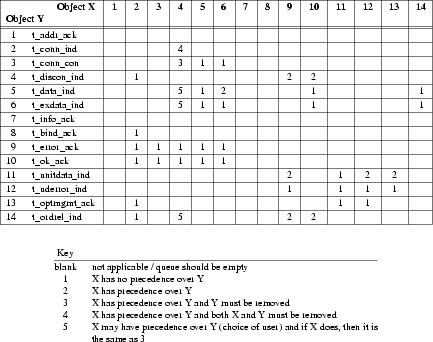 Similarly, OPT_length and OPT_offset describe the location of the requested options associated with the primitive. The proper alignment of the source address and options in the M_PROTO message block is not guaranteed. 2.3.2.2 T_UDERROR_IND - unitdata error indication. Where PRIM_type identifies the primitive type. DEST_length is the length of the destination address and DEST_offset is the offset from the beginning of the M_PROTO message block where the destination address begins. Similarly, OPT_length and OPT_offset describe the location of the requested options associated with the primitive. ERROR_type defines the protocol dependent error code. The proper alignment of the destination address and options in the M_PROTO message block is not guaranteed. Although the structure elements in the Transport Provider Interface are declared as long data types, the value the transport provider assigns to those elements that refer to this note must not be greater than the maximum value of an int data type because the corresponding user level structure element is declared as an int. There are two error handling facilities available to the transport user: one to handle non-fatal errors and one to handle fatal errors. The non-fatal errors are those that a transport user can correct, and are reported in the form of an error acknowledgement to the appropriate primitive in error. Only those primitives which require acknowledgements may generate a non-fatal error acknowledgement. These acknowledgements always report a syntactical error in the specified primitive when the transport provider receives the primitive. The primitive descriptions above define those primitives and rules regarding the acknowledgement of them. These errors are reported to the transport user via the T_ERROR_ACK primitive, and give the transport user the option of reissuing the transport service primitive that caused the error. The T_ERROR_ACK primitive also indicates to the transport user that no action was taken by the transport provider upon receipt of the primitive which caused the error. These errors do not change the state of the transport service interface as seen by the transport user. The state of the interface after the issuance of a T_ERROR_ACK primitive should be the same as it was before the transport provider received the interface primitive that was in error. The allowable errors that can be reported on the receipt of a transport initiated primitive are presented in the description of the appropriate primitives. Fatal errors are those which can not be corrected by the transport user, or those errors which result in an uncorrectable error in the interface or in the transport provider. The most common of these errors are listed under the appropriate primitives. The transport provider should issue fatal errors only if the transport user can not correct the condition which caused the error or if the transport provider has no means of reporting a transport user correctable error. If the transport provider detects an uncorrectable non-protocol error internal to the transport provider, the provider should issue a fatal error to the user. Fatal errors are indicated to the transport user via the STREAMS message type M_ERROR with the UNIX® System error [EPROTO]. This is the only type of error that the transport provider should use to indicate a fatal protocol error to the transport user. The message M_ERROR will result in the failure of all the operating system service routines on the stream. The only way for a user to recover from a fatal error is to ensure that all processes close the file associated with the stream. At that point, the user may reopen the file associated with the stream. It is the responsibility of the transport provider to keep record of the state of the interface as viewed by the transport user. The transport provider must never issue a primitive that places the interface out of state. The uninitialized state of a stream is the initial and final state, and it must be bound (see T_BIND_REQ primitive) before the transport provider may view it as an active stream. If the transport provider sends a M_ERROR upstream, it should also drop any further messages received on its write side of the stream. The following rules apply only to the connection-mode transport services. A transport connection release procedure can be initiated at any time during the transport connection establishment or data transfer phase. 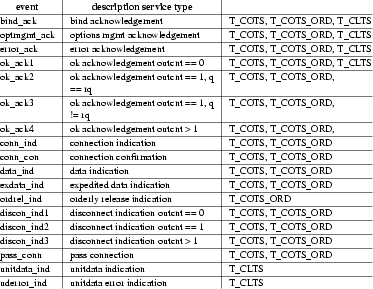 The state tables for the connection-mode transport service providers include the management of the sequence numbering when a transport provider sends multiple T_CONN_IND requests without waiting for the response of the previously sent indication. It is the responsibility of the transport providers not to change state until all the indications have been responded to, therefore the provider should remain in the indications have been responded to. The stream which is to accept the current state of the interface must be bound to an appropriate protocol address and must be in the idle state. The user transferring the current state of a stream must have correct permissions for the use of the protocol address bound to the accepting stream. The stream which transfers the state of the transport interface must be placed into an appropriate state after the completion of the transfer. The transport provider has responsibility for determining precedence on its stream write queue, as per the rules in section 5. The appendix specifies the rules for precedence for both the connection-mode and connectionless-mode transport services. The transport user has responsibility for determining precedence on its stream read queue, as per the rules in section 5. All primitives on the stream are assumed to be placed on the queue in the correct sequence as defined above. The following rules apply only to the connection-mode transport services. There is no guarantee of delivery of user data once a T_DISCON_REQ primitive has been issued. The following rules pertain to flushing the stream queues. No other flushes should be needed to keep the queues in the proper condition. The transport providers must be aware that they will receive M_FLUSH messages from upstream. These flush requests are issued to ensure that the providers receive certain messages and primitives. It is the responsibility of the providers to act appropriately as deemed necessary by the providers. The transport provider must send up a M_FLUSH message to flush both the read and write queues after receiving a successful T_UNBIND_REQ message and prior to issuing the T_OK_ACK primitive. The following rules pertain only to the connection-mode transport providers. If the interface is in the T_DATA_XFER, T_WIND_ORDREL or T_WACK_ORDREL state, the transport provider must send up a M_FLUSH message to flush both the read and write queues before sending up a T_DISCON_IND. If the interface is in the T_DATA_XFER, T_WIND_ORDREL or T_WACK_ORDREL state, the transport provider must send up a M_FLUSH message to flush both the read and write queues after receiving a successful T_DISCON_REQ message and before issuing the T_OK_ACK primitive. 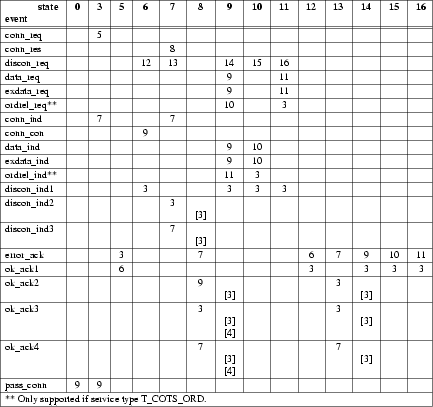 The following table maps those transport primitives as seen by the transport provider to the STREAMS message types used to realize the primitives and to the ISO IS 8072 and IS8072/DAD1 transport service definition primitives. The following tables describe the possible events that may occur on the interface and the possible states as viewed by the transport user that the interface may enter due to an event. The events map directly to the transport service interface primitives as described in section 2. 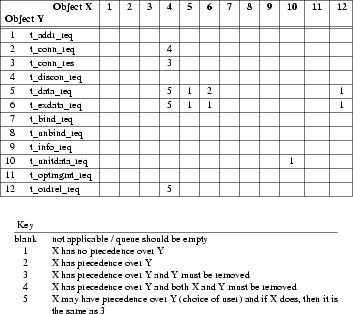 The following describes the variables and outputs used in the state tables. The following outgoing events are those which are initiated from the transport service user. They either make requests of the transport provider or respond to an event of the transport provider. The following incoming events are those which are initiated from the transport provider. They are either confirmations of a request or are indications to the transport user that an event has occurred. The following tables describes the possible next states the interface may enter given a current state and event. The contents of each box represent the next state given the current state (column) and the current incoming or outgoing event (row). An empty box represents a state/event combination that is invalid. Along with the next state, each box may include an action. The transport provider must take the specific actions in the order specified in the state table. The following describes the precedence of the transport primitives for both the stream14 write and read queues. It is assumed that the reader of this document is familiar with the concept STREAMS. The T_INFO_REQ and T_INFO_ACK primitives have no effect on the state of the transport provider and do not appear in the state tables. A stream is viewed as active when the transport provider may receive and transmit TPDUs (transportprotocol data units) associated with the stream. All lengths, offsets, and sizes in all structures refer to the number of bytes. This field should be ignored by those providing a connectionless transport service. 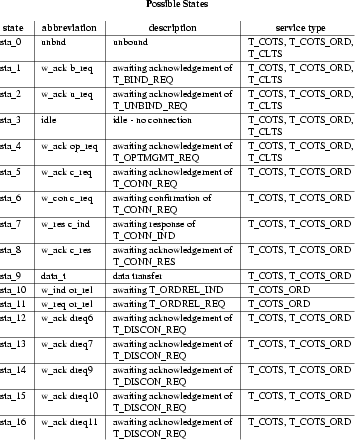 If the number of outstanding connect indications equals CONIND_number, the transport provider need not discard further incoming connect indications, but may chose to queue them internally until the number of outstanding connect indications drops below CONIND_number. This is the amount of user data that may be present in a single T_DATA_REQ or T_EXDATA_REQ primitive. This field doesn't apply to connectionless transport providers. For a overview of the error handling capabilities available to the transport provider see section 2.4. The information located by the defined structures may not be in the proper alignment in the message blocks, so the casting of structure definitions over these fields may produce incorrect results. It is advised that the transport providers supply exact format specifications for the appropriate information to the transport users. The maximum transport service data unit size allowed by the transport provider is indicated to the transport user via the T_INFO_ACK primitive. The maximum size of a expedited transport service data unit is indicated to the transport user via theT_INFO_ACK primitive. The stream queue which contains the transport user initiated primitives is referred to as the stream write queue. The stream queue which contains the transport provider initiated primitives is referred to as the stream read queue.